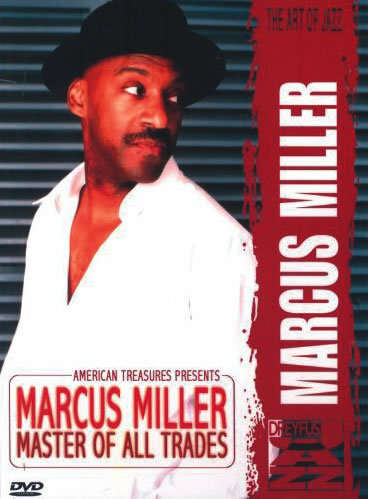 Recorded live at Hollywood’s Knitting Factory for the American Treasures series, Master of All Trades is indeed a pearl for Miller devotees-one disc containing a beautifully produced concert and another featuring a bonus documentary and extra performances. The live disc includes inspired performances of Miller’s crossover electric material, and fortunately, nothing gets overly smooth as Miller alternates groove-tastic original material with equally funky interpretations: “So What” begins misleadingly as a straightahead read-through before being updated with danceable quiet-storm rhythms. That acoustic-era Miles classic is reprised briefly during the closing “Miles Medley,” where the band cuts and pastes classic Miller compositions like “Hannibal” and “Tutu”-reminders that Miller’s tunes were inventive moments of reprieve during Miles’ frightful “Human Nature” era. Throughout the show, Miller is a superb leader on four strings, providing unerring rhythmic glue and soloing with a bedazzlement typically reserved for six-stringers. Miller surely deserves the grand accolades slathered on him during the bonus documentary, though one talking head’s claim that he’s the “Michael Jordan of music” takes well-meaning praise over the edge.